Kita Butuh "Kenosis Ganda" Catatan Kecil atas Tema "Living God Renew and Transform Us"
The General Session of the 26th World Communion of Reformed Church (WCRC) at Leipzig, Germany in the next 2017, take as its theme “Living God Renew and Transform Us.” The theme contains two value premises. First, the Living God renews and transforms. Second, we (human being) are renewed and transformed. This writing put the discussion on the second premise first, i.e. the renewed and transformed man. Why? Because a discussion on God hardly inseparable from the discussion on human. What the human have been done for the shake of the good and the just life at the same time is a depiction of what God wants to do for the human’s life in this world. For the matter of that double kenosis are needed that enable I and the other experience the mutual life transformation and open the life spaces in which the justice is its principal value. Banawiratma, J.B. 2000. "Contextual Christology and Christian Praxis: An Indonesian Reflection". Dalam East Asian Pastoral Review. Vol. 37, No. 2. __________ . 2014. Pemberdayaan Diri Jemaat dan Teologi Praktis Melalui Appreciative Inquiry (AI). Yogyakarta: PT. Kanisius dan Pusat Pastoral Yogyakarta. Brubaker, Pamela, dan Rogate Mshana (Ed.). 2015.Justice Not Greed: Keadilan Bukan Ketamakan. Jakarta: PMK HKBP Jakarta dan Pokja Oikotree. Calvin, John. 1989.Institutes of the Christian Religion. Terj. Henry Beveridge. Grand Rapids, Michigan: Eerdmans Publishing Company. Fransiscus, Paus. 2016. Bulla Pemakluman Tahun Yubileum Kerahiman Ilahi Luar Biasa. Yogyakarta: Kanisius. Fransiskus, Paus. tt. Ensiklik Laudato Si': Tentang Perawatan Rumah Kita Bersama. Terj. Martin Harun. Jakarta: Obor. Hasani,Ismail,dan Bonar Tigor Naipospos (Ed.). 2010. Wajah Para 'Pembela' Islam: Radikalisme Agama dan Implikasinya Terhadap Jaminan Kebebasan Beragama/Berkeyakinan di Jabodetabek dan Jawa Barat. Jakarta: Tim Setara Institute dan Pustaka Masyarakat Setara. Hermans, Chris A.M. & Mary E. Moore (Eds.). 2004. Hermeneutics and Empirical Research in Practical Theology. Leiden, Boston: Brill. Jones, Serena. 1995. Calvin and Rhetoric of Piety. Louisville, Kentucky: Westminster John Knox Press. Justice, Peace and Creation Team. 2006. Alternative Globalization Addressing People and Earth (AGAPE): A Background Document. Geneva: World Council of Churches. Kirchberger, Georg. 2010. Gerakan Ekumene: Suatu Panduan. Maumere: Ledalero. McVey, Chrys. 1990. "Aloysius Pieris and The Asian Style of Doing Theology". 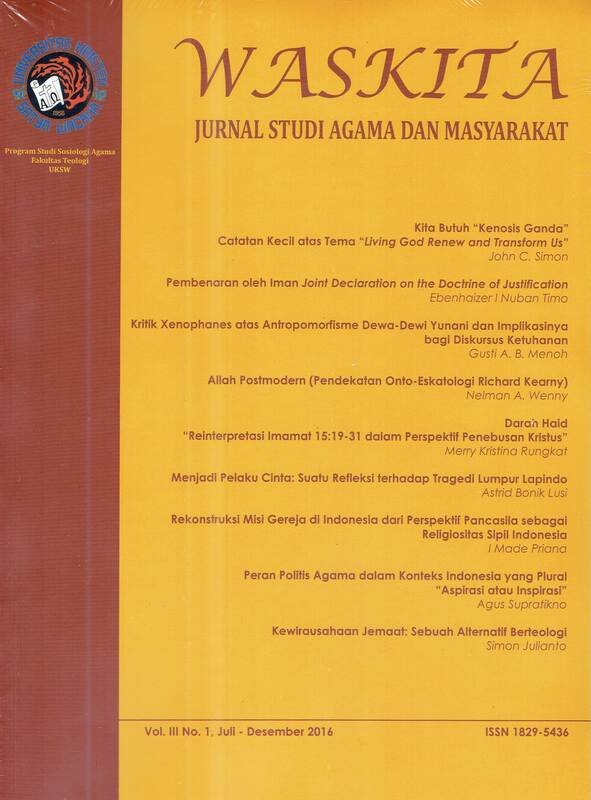 Dalam Al-Mushir: Theological Journal of the Christian Study Centre. Rawalpindi, Pakistan. Vol. 32, No. 4. Mshana, Rogate R., dan Athena Peralta (Ed.). 2016. Linking Poverty, Wealth and Ecology (Mengaitkan Kemiskinan, Kesejahteraan dan Ekologi): Proses AGAPE dari Porto Alegre Hingga ke Busan. Jakarta: PMK HKBP Jakarta dan Pokja Oikotree. Persekutuan Gereja-Gereja di Indonesia. 2015. Potret dan Tantangan Gerakan Oikoumene: Laporan Penelitian Survei Oikoumene PGI 2013. Jakarta: BPK Gunung Mulia. Persekutuan Gereja-Gereja di Indonesia. 2015. Dokumen Keesaan Gereja Persekutuan Gereja-Gereja di Indonesia (DKG-PGI) 2014-2019. Jakarta: BPK Gunung Mulia. Rawls, John. 1971. A Theory of Justice. Cambridge, Massachusetts: Harvard University Press. Ricoeur,Paul. 1970. Freud and Philosophy: An Essay on Interpretation. Terj. Denis Savage. New Haven: Yale University Press. ______ . 1974. The Conflict of Interpretations: Essays in Hermeneutics. Ed. Don Ihde. Evanston: Northwestern University Press. ______ . 1980.Essays on Biblical Interpretation.Editor Lewis S. Mudge.Philadelphia: Fortress Press. ______ . 1982. Hermeneutics and the Human Sciences: Essays on Language, Action and Interpretation. Terj. John B. Thompson. Cambridge: Cambridge University Press. ______ . 1982. "The Status of Vorstellung in Hagel's Philosophy of Religion". Dalam Leroy S. Rouner (Ed.). Meaning, Truth, and God. Notre Dame & London: University of Notre Dame Press. ______ . 1992. Oneself as Another. Terj. Kathleen Blamey. Chicago and London: The University of Chicago Press. ______ . 1994. "Responsibility and Fragility: An Ethical Reflection". Dalam Religious Traditions: A Journal in the Study of Religion. 25 Juli. ______ . 1999. "Approaching the Human Person". Dalam Ethical Perspectives. Vol. 6, No. 1, April. ______ .2004. Memory, History, Forgetting. Terjemahan Kathleen Blamey dan David Pellauer. Chicago & London: The Universityof Chicago Press. Song, Choan-Seng. 1984. Tell Us Our Name: Story Theology From an Asian Perspective. New York: Orbis Books. Swidler,L. (Peny.). 1987. Toward a Universal Theology of Religion. NewYork. wcrc.ch/jddj, diunduh pada 19 Oktober 2016, pkl. 12.34.